Dodge Ball: The children line up in two lines facing one another. Each team has several soft balls to toss at the other team’s legs. If you’re tagged by a ball, you’re out! The children learn honesty in action. Noodle Games: The “It” Child is given a pool noodle. All the children are told to run around the training floor. If the child tags another child with the noodle, that child is out. The other day, Master Pena told me that during the noodle game, one of the 5 year old children raised his hand and said, “so and so is not being honest. I tagged him but he’s not being honest and sitting down.” What’s interesting here is not that the child is speaking up, but the words he’s choosing to say. He is showing that he understands the concept of honesty and can use it correctly to illustrate a point. Please don’t forget for one moment the impact of what you choose to teach everyday. You are critical in your students’ development. Through Powerful Words, your curriculum, and your creativity, you are creating leaders with character. If you’re using any other honesty games, please let us know so we can post them up for everyone in the Powerful Words family to use! We always loved “bowling” in which the children were the pins! The children jump over or side step a ball or other soft object (we always used the tops of the heavy bags that slid right off the bases) that were tossed by the teachers or teen helpers. The kids loved it. Again, if you got tagged, you needed to be honest, and take yourself out of the game. Last one standing was the winner. Have a great honesty month! They want to be just like you. Are you being a positive role model? Note: This article appears in an altered form on Dr. Robyn’s Powerful Parenting Blog as a service of the Powerful Words Character Program for member schools. A role model is a person whose behavior is imitated by others. Of course, there are both good role models and bad role models. There’s even the counterintuitive anti-role model, discussed in today’s Boston Globe, who behaves so badly that s/he serves as a good example of what NOT to do. We all hope that children have good, strong role models who possess the kind of qualities that make our students want to be (and become) better people. While there is some variation in every teacher’s definition of what it means to be a good person, the following 7 characteristics of a positive role model remain constant. (1) Model positive choice-making: Little eyes are watching and little ears are listening. When it comes to being a role model, you must be aware that the choices you make don’t only impact you but also the children who regard you as their superhero. Someday, they will be in the same predicament and think to themselves, “What did s/he do when s/he was in the same situation?” When you are a role model it’s not enough to tell your charges the best choices to make. You must put them into action yourself. (2) Think out loud: When you have a tough choice to make, allow the children to see how you work through the problem, weight the pros and cons, and come to a decision. The process of making a good decision is a skill. A good role model will not only show a child which decision is best, but also how they to come to that conclusion. That way, the child will be able to follow that reasoning when they are in a similar situation. (3) Apologize and admit mistakes: Nobody’s perfect. When you make a bad choice, let those who are watching and learning from you know that you made a mistake and how you plan to correct it. This will help them to understand that (a) everyone makes mistakes; (b) it’s not the end of the world; (c) you can make it right; and (d) you should take responsibility for it as soon as possible. By apologizing, admitting your mistake, and repairing the damage, you will be demonstrating an important yet often overlooked part of being a role model. 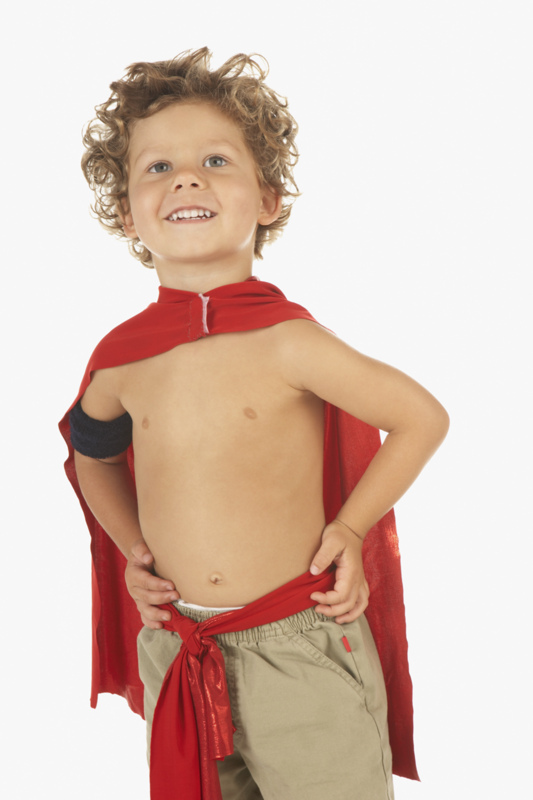 (4) Follow through: We all want children to stick with their commitments and follow through with their promises. However, as adults, we get busy, distracted, and sometimes, a bit lazy. To be a good role model, we must demonstrate stick-to-itiveness and self discipline. That means; (a) be on time; (b) finish what you started; (c) don’t quit; (d) keep your word; and (e) don’t back off when things get challenging. When role models follow through with their goals, it teaches children that it can be done and helps them adopt an “if s/he can do it, so can I” attitude. (5) Show respect: You may be driven, successful, and smart but whether you choose to show respect or not speaks volumes about the type of attitude it takes to make it in life. We always tell children to “treat others the way we want to be treated” and yet, may not subscribe to that axiom ourselves. Do you step on others to get ahead? Do you take your spouse, friends, staff or colleagues for granted? Do you show gratitude or attitude when others help you? In this case, it’s often the little things you do that make the biggest difference in how children perceive how to succeed in business and relationships. (6) Be well rounded: While we don’t want to spread ourselves too thin, it’s important to show children that we can be more than just one thing. Great role models aren’t just “teachers.” They’re people who show curiosities and have varied interests. They’re great learners and challenge themselves to get out of their comfort zones. You may be a teacher who’s also a student of martial arts or yoga, a great chef, a good sportsman, a father and a treasured friend. You may be a coach who’s a gifted dancer, a solid rock climber, a celebrated singer, a mother and a curious photographer. When children see that their role models can be many things, they will learn that they don’t need to pigeon-hole themselves in order to be successful. (7) Demonstrate confidence in who you are: Whatever you choose to do with your life, be proud of the person you’ve become and continue to become. It may have been a long road and you may have experienced bumps along the way, but it’s the responsibility of a role model to commemorate the lessons learned, the strength we’ve amassed, and the character they’ve developed. We can always get better, however, in order for children to celebrate who they are, their role models need to show that confidence doesn’t start “5 pounds from now,” “2 more wins on top of this one,” or “1 more possession than I have today.” We must continue to strive while being happy with how far we’ve come at the same time. 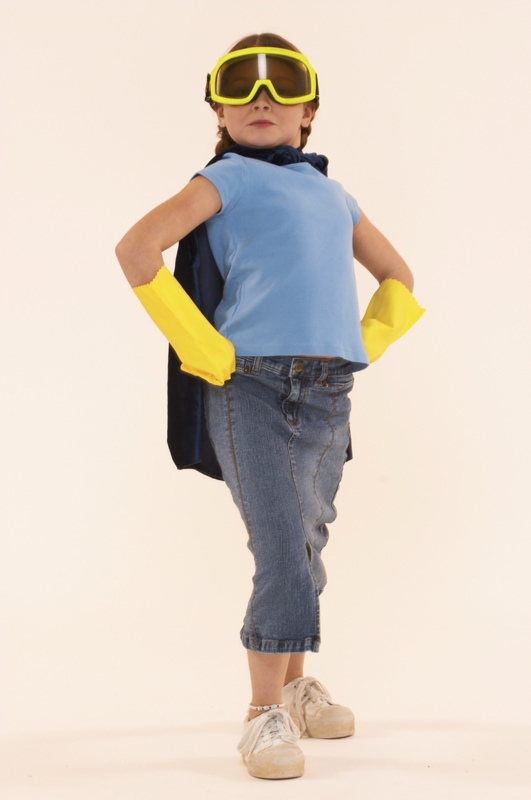 While it may seem like a great deal of pressure to be a positive role model; nobody is expecting you to be superhuman. We certainly wouldn’t expect that behavior from the children who are looking to us for answers and guidance—nor would we want them to expect that kind of flawless behavior from themselves or others. You can only do your best. And, if you mess up today, you can always refer back to tip #3 and try again tomorrow. Good role models earn multiple chances from the children who believe in them and know they can do anything if they simply put their mind to it. Here’s to a Powerful Week! Teaching by example. We talk about it often. 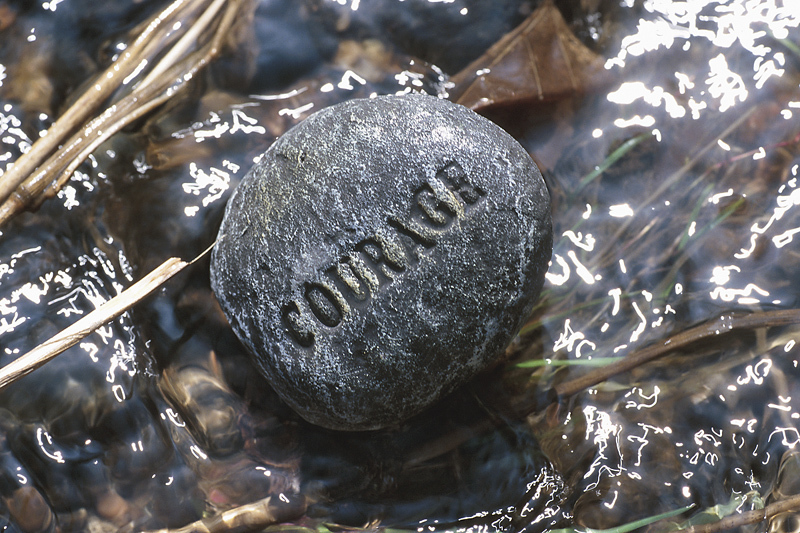 But how do we teach courage when adult life can often appear mundane or monotonous? Sometimes, we just have to do something out of the ordinary. Just as our coach did with us, when I work with my coaching clients on envisioning their best year for 2008, I ask them to “name their year.” For confidentiality sake, I won’t divulge what my clients have come up with but I’ll let you know my own personal label for 2008; The Year of Taking Risks. Not stupid risks (well, I’ll certainly try not to make those) but risks that push me. In keeping with that theme, each week, I make sure that I do something to get me out of my comfort zone. We’re all so busy. Who has time for risk-taking? But in order to evolve, it’s important to put yourself out there, don’t you think? Adulthood can get a little too comfortable and predictable—and that makes us get stale. I know Jason told our Powerful Words Family that I earned the part of Rosie in my community theater’s rendition of “Bye Bye Birdie.” In fact, this weekend is opening weekend and last night was opening night. It’s thrilling and scary and fun all rolled up into each performance. Many of the responses we received were of surprise or shock– who knew? It seems so “out of character,” right? But I figure, sometimes out of character means strengthening character. It was only a few short month’s ago that I finished playing the part of Joy, the wicked stepsister, in Cinderella. Performing in both plays was part of taking risks—not just because I tried out for the plays, but because of what I need to do with the characters to make them interesting. Perhaps like many of you, I consider myself a pretty focused, happy, friendly, straight-laced person. As adults, we often find ourselves needing to be pretty serious during the typical day—and we loose the silliness in our life. Even working with kids doesn’t always save us from being, well, a bit mundane. Landing the part of Joy in Cinderella meant I needed to be everything opposite of my norm; miserable, ridiculous, confrontational, over-the-top and yes, absolutely silly. When I first started rehearsals, I remember feeling uncomfortable. The director pushed me and I started taking risks. It was hard to get out of rehearsals without laughing a good belly laugh at the craziness of it all. I found the humor in Joy, and more importantly, it helped me to find the humor in myself. Rosie has helped me uncover another side of myself that can sometimes be squashed in the day to day. Yes, she can be brazen and sassy, but I’m referring more to what it took for me to play the part. Courage. The role calls for a lot of singing—sometimes being left on stage for minutes at a time while the spotlight focuses just on one person; me. The opportunity reminded me about putting confidence and courage into action. We all talk about doing these things—but do we really challenge ourselves? It seems to me, and I hope you agree, that our students have this same opportunity when they join your academies. Perhaps in their regular life they’re shy, or they’re perceived as “not the type” to show up at a school like yours. You know who I’m talking about, right? At first, they might seem timid or unsure of themselves. But over time, something clicks and they aren’t just going through the motions anymore. The activity gets into their blood, and the process brings out a side of them that they might not have even known existed. What a gift. Let’s encourage our students, staff, and ourselves to take the kind of risks that allow them to uncover sides of themselves that they haven’t seen for a while—or maybe even a side that they never knew existed. This makes us better students and teachers and more dynamic, more interesting people. Here’s to doing something out-of-character that builds character! As most people know about me, I’m a big fan of systems. 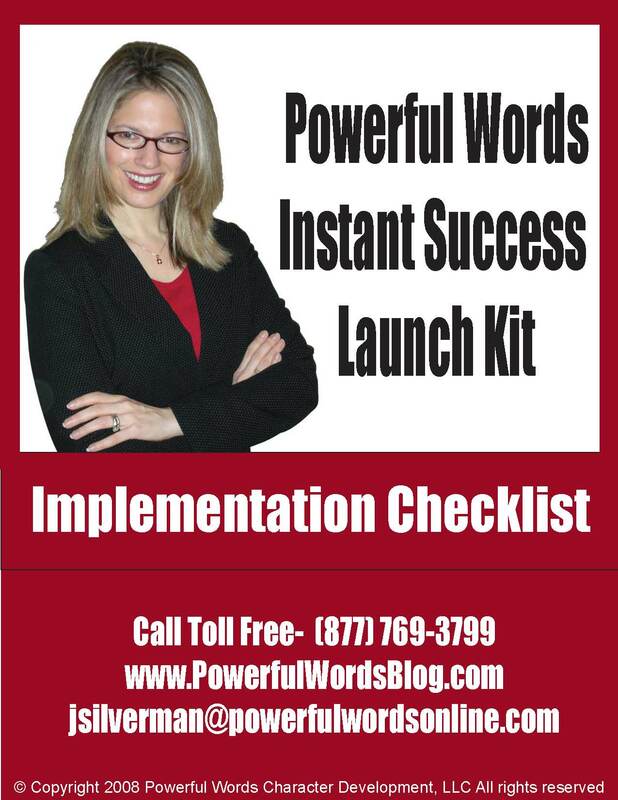 That being the case, I’ve just created a great checklist for brand new POWerful Words clients to ensure that they quickly, easily, painlessly, and properly implement our system in their school(s). you might be interested in a copy of this checklist to make sure that YOU have implemented everything successfully as well! If you’re interested, shoot me an e-mail (Current Client ONLY) and I’ll get it to you for free – ASAP! Many of my personal coaching clients find it useful to create checklists for every job that gets done at their school. It’s a fantastic way to create a system that your staff can easily follow every single day. I’d be interested in seeing what types of systems you’ve built for your school – if you feel that you’ve got a helpful checklisted system that the Powerful Words family would benefit from, please take a moment to either post it here or e-mail it to me so that I can help everybody to succeed! P.S. 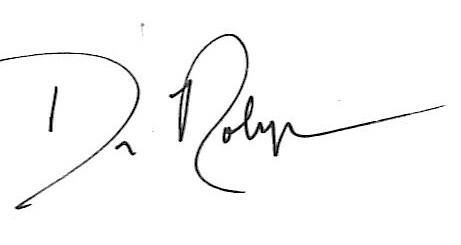 Have you signed up for Dr. Robyn’s new weekly audio newsletter at http://www.PowerMoment.com? 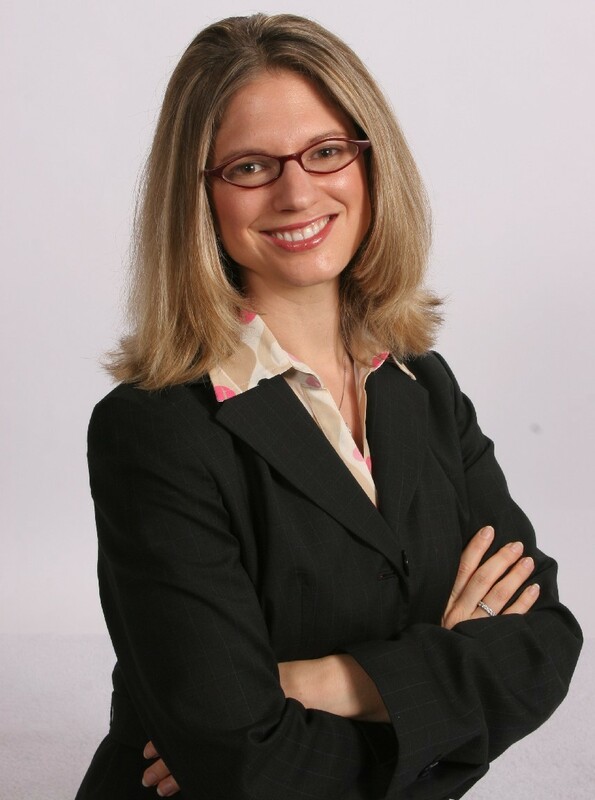 New Resource Announced Today from Dr. Robyn Silverman! I am thrilled to invite you to take advantage of a brand new Free Audio Coaching Newsletter with Dr. Robyn Silverman…each and every week! This newsletter is designed to help you and your staff become more effective at what you do and the best part about it…it’s free. Dr. Robyn wants to see more schools succeeding and feels that this information will be helpful to everyone. Sign up and you’ll receive the very first episode immediately in your inbox! Again, check out The Power Moment right now! I’m going to start using the Power Moment Accountability Sheet to keep me on track. I will start this afternoon and I’ll know it’s complete when I see the papers on my desk bulletin board with the first one marked COMPLETE! I will also use a similar form with students that could use an extra help with accountability. Great program – You Rock! owns a school that would like to achieve more success?